I eat beets. I order beets. I generally really love beets. But I never buy them. So when they showed up on my doorstep in my Summerland box I got super excited. Especially since they're good for your liver. And my liver needs love. We have had houseguests for almost two weeks, sadly ending a few days ago when our dear friend Kelly, in town for her baby shower, left Los Angeles for her new home in Atlanta. And before her lovely visit, my folks were here for nearly a week, spoiling us with love, groceries, and a culinary tour of L.A., also helping with an Easter party at my in-laws home in Malibu. We literally ate and drank our way around town; spoiled at Sotto, The Ivy, Tra Di Noi,Girasol, Bloom Cafe, and Paper or Plastik. I now need a girdle, a juice cleanse, and a wine break. Much less expensive than said juice cleanse, and in my opinion, just as good-for-you. In my new kitchen...well new by six months... I'm fascinated by the light that comes in these windows. Even more, I'm shamefully accustomed to our warm, freakishly warm weather, when I'm able to open my side kitchen door, let the light and warmth in, and capture something as beautiful as this crimson earthy veggie; a veggie that tastes like candy. I've said I love spinach. I love beet greens more. It's super easy to write about beets. It's really no big deal. My quest for a cleanse is the bigger deal. The heavier deal. As I've aged, as I've matured and grown (I think) wiser... I've also settled into some habits I'm somewhat weary of, even scared of. Beets have brought me to my knees, on the heels of seeing many folks at the mercy of addiction, enslaved by the numbness that feels so good. I find myself, after ten months of sobriety due to pregnancy, save a glass of wine here and there, right back to my old ways. Able to drink wine like water. And I have to wonder, is it in me? Is it a part of my genetics that makes it so easy to be superfluous? Or is it stored up thirst, after months of discipline and abstinence? Can I control it? I don't mean to claim serious addiction, and don't want anyone to worry about me! I just ask these questions as a girl in her late thirties, getting used to bad habits, growing more and more aware of the hold these rituals have on me. And paying attention to the grip. So relax. I just added a picture to relieve some intensity. It's truly no laughing matter, and no place for me to make light of such a heavy issue. But beets are beating me up. If you have a friend or family member who struggles with addiction, or you yourself are struggling, check outAl-Anon or AA, or reach out to a friend, mentor, elder, church member, or anyone you can confide in. And enjoy roasting some super healthy beets. Remove beet stems, leaving 2 inches of stem in tact, to prevent bleeding. 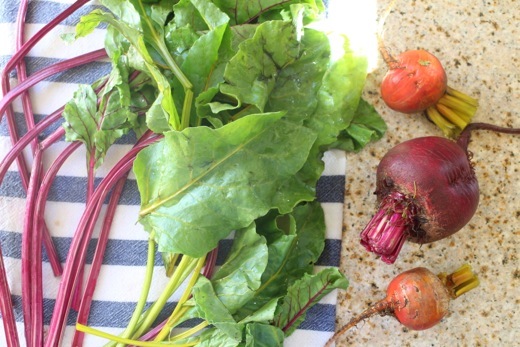 Wash beets thoroughly and toss with 2 tbsp olive oil and a pinch of salt. Cover. 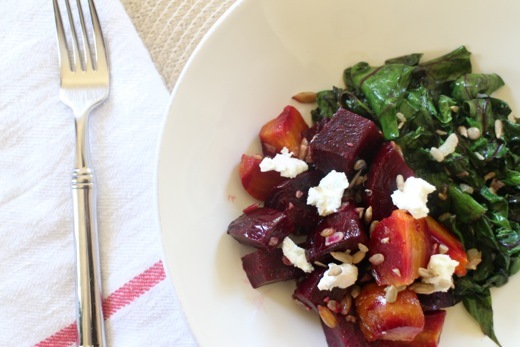 Roast beets for 45-60 minutes or until knife-tender. Just before beets are done, heat 1 tbsp olive oil in a hot pan. Add garlic and cook for about a minute. Tear greens in 2-3 inch pieces and add to pan, sautéing until wilted, a minute or two. Season with salt and pepper. 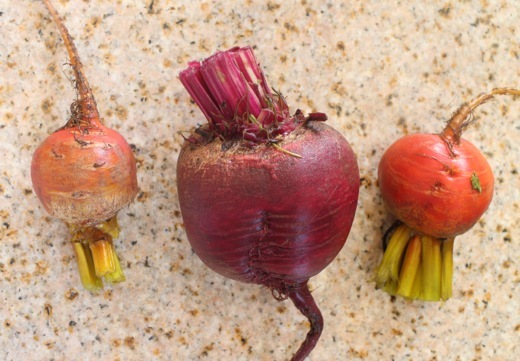 Once beets are cool enough to handle, peel (your hands will be beautiful bright colors!) and cut into large pieces. Toss beets with a pinch of salt and sunflower seeds. 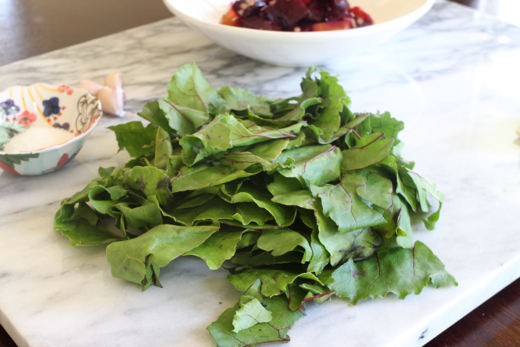 Dollop with goat cheese and serve with wilted greens.